← It has been a very bird orientated day! Elsie is a cute, but quite determined hen. Maybe this is a trait of hens, I’m not sure yet, but I suspect I will come to understand them…… Today she was free from her little prison, the idea being that she would have come to know where home and food and water is by being left in her house for a day or two, but also I had been out all day and I wasn’t sure yet that she could be left out. 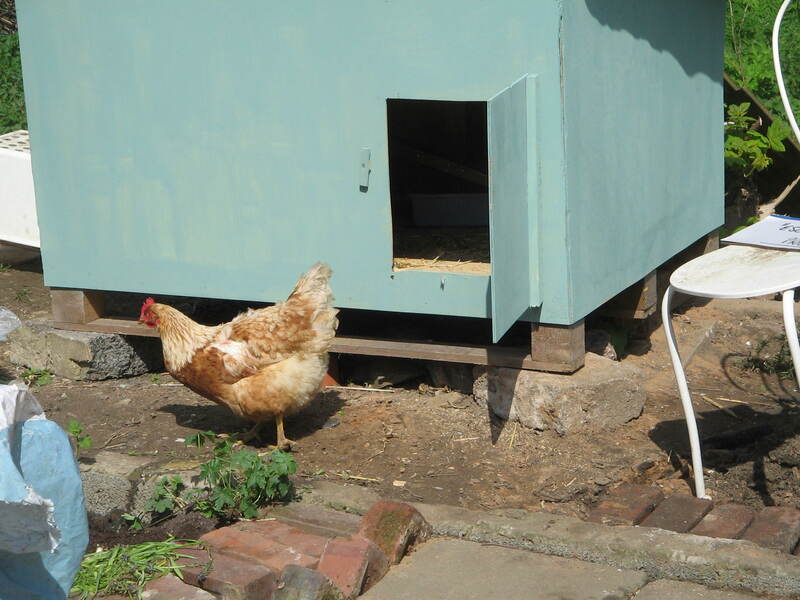 So off she went, into the garden next door, into the gap where she was trapped between the hut and the fence, but eventually she settled down and scratched and pecked her way around and seemed to be thoroughly enjoying herself. But what to do when it’s time for bed? Having sought advice about how to get your hen back in her house at bedtime, I was advised to start a trail of chicken feed and talk to her. Hah! She wasn’t listening to me…..oh no, she was listening to the call of the wild – or something. Only one things’ for sure, whenever I went anywhere near her she went off in the opposite direction. Anyhow I persisted and persisted and eventually she got the message and stepped into the hen house, and so she’s safely tucked up for the night. Phew. How on earth will I manage when she has some friends? I’ve asked about getting her a couple of pals, I think she’ll be much happier…..and I shall have eggs! What a bonus. So far Elsie has laid an egg every day, I suspect I may be eating omelets a little bit more often than I do at the moment, but very nice omelets.